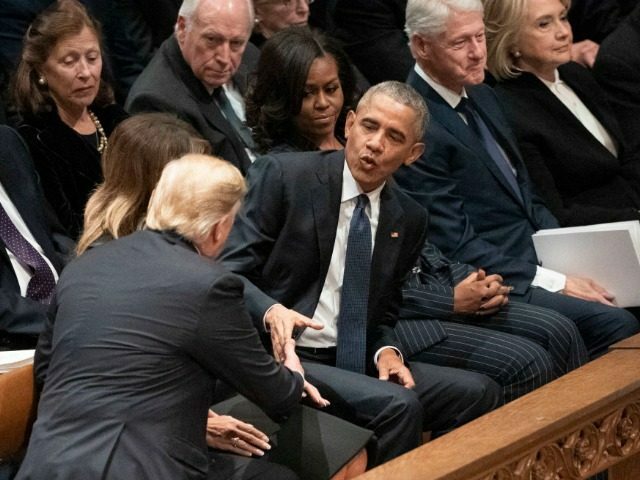 CNN contributor Michael D’Antonio blasted President Donald Trump on Wednesday evening for not having the “courage” to shake the hands of former Presidents Bill Clinton and Jimmy Carter and former First Lady Hillary Clinton at President George H.W. Bush’s funeral. The Trump biographer told host Don Lemon that Trump seemed like a “pariah” in the club of presidents. D’Antonio said former President Barack Obama and former First Lady Michelle Obama were “gracious” when Trump greeted them at the funeral before criticizing Trump for not greeting the Clintons and the Carters. “President Trump had an opportunity to work his way down that line and greet each person if he had the courage to do so,” D’Antonio said. CNN panelists throughout the day pointed out that Hillary Clinton refused to make eye contact with Trump. CNN’s presidential historian Douglas Brinkley said the moment must have been “extremely awkward” for Michelle Obama because she “has zero interest in Donald Trump.” Brinkley, who earlier in the week said that “nobody” wanted to see Trump at the funeral, also said that Trump did not have the “class” to take a moment and greet Carter, who has been battling cancer. D’Antoni said “this is uncharted territory” while Lemon said many viewers watched the funeral because they were curious about how Trump and the former presidents would interact.